Woodcuts by former South Florida State College Museum of Florida Art and Culture Curator Mollie Doctrow sit along the unique Wildflower Wayside Shrine Trail across College Drive from the SFSC Art Department. The sand trail features a number of woodcuts, each depicting a different Florida native wildflower, along the leisurely loop. The woodcuts are attached to boxes that house paper and pencils for hikers to make their own rubbings from the woodcuts, creating “prints” of Doctrow’s work and a keepsake to take home with them from their trip to the trail. 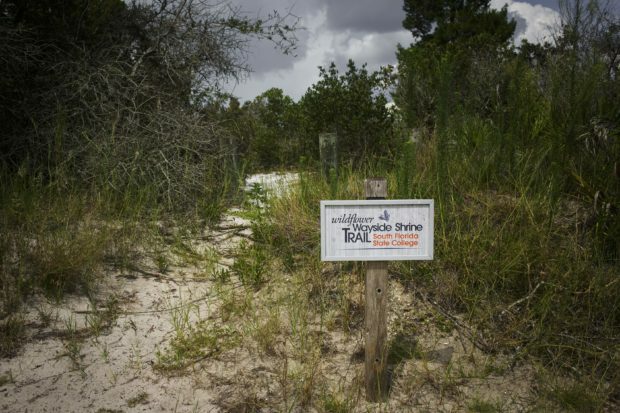 So Doctrow secured a $25,000 state grant and $25,000 from Art Museum of the Americas to establish six Wayside Shrine Trail boxes where the pygmy fringe trees grow. The first box is where animals had established their own walking trail. “I thought, ‘My gosh, what a great place,’” said Doctrow, who retired a few months ago. Uniquely, Doctrow carved woodcuts of plants that could be found along the trail. “You can bring paper and a crayon and make a rubbing of the carved box covers.” She also created a website to explain the trail: waysideshrinetrail.com. For the complete article go to Highlands Today.